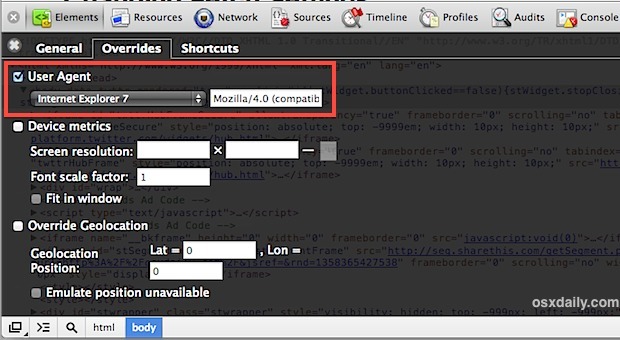 A web browsers user agent is how a website knows what type of computer, operating system, and browsing app you are using. Some sites serve different themes, CSS, content, or even different sites to different browsers and OS’s, and many developers often need to change their own user agent to be able to test these abilities and build these alternate sites. 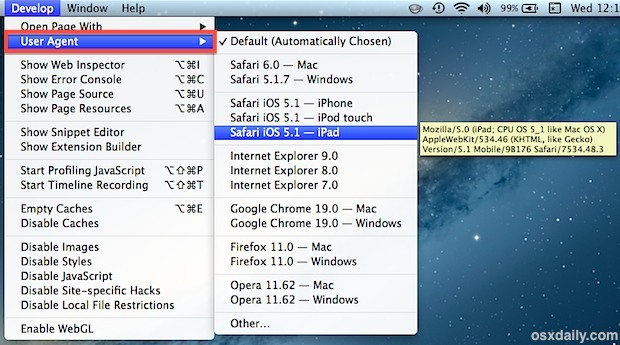 We’ll cover how to change the user agent for all popular modern web browsers available to the desktop user in Mac OS X and Windows, including Chrome, Safari, and Firefox. This works in Chrome for Mac, Windows, and Linux. Chrome also instantly redraws pages with the new user agent, and if device metrics are set it will also use that devices set resolution size when redrawing the page. Note that if you hover over a specific user agent, the exact UA string used will appear in a yellow box alongside the menu item. After selecting any of the user agents, you will find the currently open web page will refresh. If the page in question happens to serve different information to alternate browsers you may find the page looks different. For example, changing a user agent to a mobile device and mobile browser may cause some web pages to send you to their mobile websites, or serve a different looking page through a responsive layout. Firefox can also do this by default, though it’s arguably the most clumsy of the modern browsers and thus not really recommended since some Firefox extensions handle it better. Keep in mind that changing the user agent does not change the way the web browser renders pages itself, unless it is being served user-agent specific content. For example, using an IE8 user agent is not the same as visiting a page with IE8 and letting it render the page, a need often mandatory for web developers. For that you will need to actually take the time to run Internet Explorer in a virtual machine on top of Mac OS X, that is free and fairly easy to set up. What about spoofing user agents from the command line? Keep in mind that changing the user agent does not change the way the web browser renders pages itself, unless it is being served user-agent specific content. For example, using an IE8 user agent is not the same as visiting a page with IE8 and letting it render the page, a need often mandatory for web developers. For that you will need to actually take the time to run Internet Explorer in a virtual machine on top of Mac OS X, that is free and fairly easy to set up if necessary. Thanks to @ImpechCerrato for the tip idea, you can follow @OSXDaily on Twitter too. This is a really good tip. Is there a way to change it on Safari for iPhone? Say, to stop websites from automatically loading as a mobile version? This really saves me from having to install an unnecessary extension. Thanks! The Army insist on making some of it’s applications very IE friendly, making it tough to do things at home. This tip is fantastic! Very helpful thank you. I had a web page that wouldn’t display. Spent 2 weeks working with IT. Only changing useragent worked. Now I’m happy. Instructions worked for Safari. Chrome instructions didn’t work and appear to be out of date. From looking at these methods to change user agent I really gotta say Maxthon does it in the easiest way. Settings > Advanced Setting > Customize UserAgent String. Done. There You Have It! “User Agent” is 3rd on the List. Deselect “Select automatically” and select Agent of choice! Unfortunately, outdated solution for Chrome; can article be updated, please? See flipflopmedia’s response for the latest solution for Chrome; I used those instructions, then went further and selected Custom and input my own. Edit: actually, my attempt to create a custom user agent did not work. I could input it into the field, but for some reason, it does not save it.